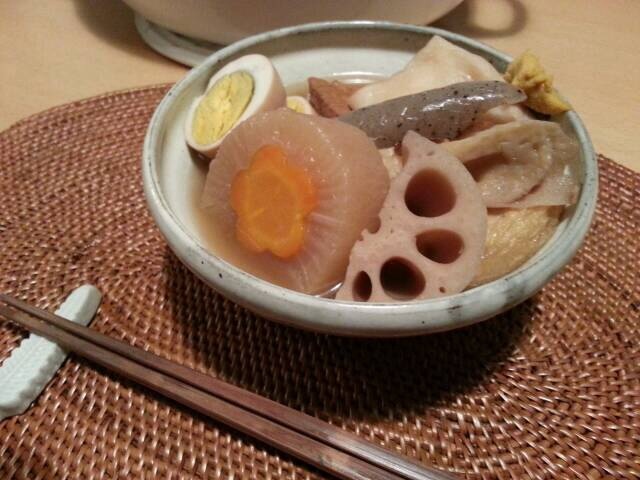 As the recipe below shows, oden is a soup that includes daikon, fish cake products, konbu, boiled eggs, and other ingredients as well, boiled in a stock flavored with soy sauce and dried bonito. Flavoring is simple to allow for the addition of a wide variety of ingredients, which could include octopus, potatoes, cabbage, and any number of other things. 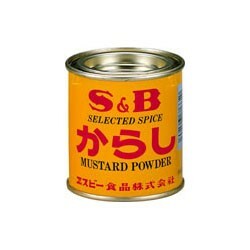 It is generally enjoyed with karashi (hot mustard). Oden has been a favorite dish in Japan since the Edo Period and, more recently, has become a common wintertime product in convenience stores. ① Soak the konbu in the water for about 1 hour and then place it over high heat. Just before the water boils, remove the konbu from the water. Add the dried bonito, bring the water up to a full boil, and then turn the heat off. If foam appears on the surface, while you are heating the water, remove it with a cooking spoon. Leave the dried bonito in the pot until all of it sinks to the bottom of the pot. Once it is all on the bottom, use a strainer to remove it. This is your basic soup stock. ② Transfer the soup stock to a large pot, and add the mirin, light soy sauce, sake and salt. Bring this to a boil and then turn off the heat. Now, you have oden soup stock. ① Put enough water to cover the five eggs into a pot, add the vinegar and eggs, and then put the pot on high heat. Once the water boils, reduce to medium heat and use chopsticks to roll the eggs to get the yolks to stabilize in the middle of each egg. In total, keep the pot on medium heat for 9 minutes. ② Transfer the eggs to cold water and peel them once they are cool enough to handle. ① Skin the daikon and cut into five round pieces. ② Parboil the daikon by placing the rounds into a pot, and adding the rice and just enough water to cover the daikon. Bring to a boil. Keep the pot at a boil just strong enough, so that the daikon pieces rock gently. Boil for about 15 minutes. ③ Transfer the daikon pieces to a strainer and rinse briefly under cold water. Use a flower-shaped die to cut a flower-shaped pattern out of the center of each piece of daikon. ④ Cut the carrot into five rounds and use the same flower-shaped die to cut flower shapes out of the centers of the carrot rounds. Place the carrot flowers into a pot with just enough water to cover them, and then bring to a boil. Boil for about 5 minutes and then transfer the carrot flowers to a strainer. 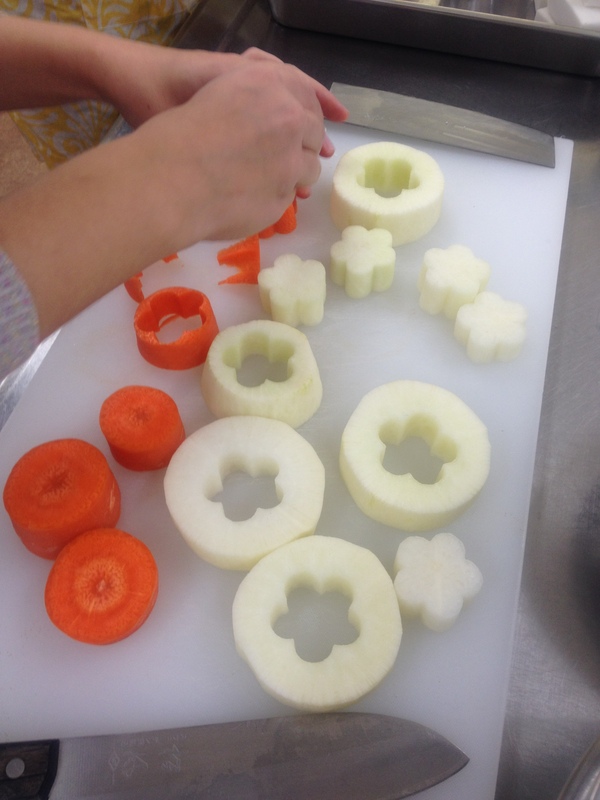 ⑤ Insert the carrot flowers into the carrot-shaped centers of the daikon rounds. These are your hana daikon. For oden and other dishes in which daikon is flavored simply with stock, it is best to parboil the daikon with water from the rinsing of rice prior to cooking, or with a little bit of rice added to the water for boiling the daikon. Doing this helps to tone down the prominent “raw vegetable” smell and bitterness that are often found with daikon, round out the flavor, and allow the daikon to take on other flavors. It will also make the color of the daikon whiter. ① Cut the abura-age in half, so that you have two more or less square pieces. Pour boiling water over them to remove excess oil. ② Carefully open the abura-age squares, so that they form pockets. 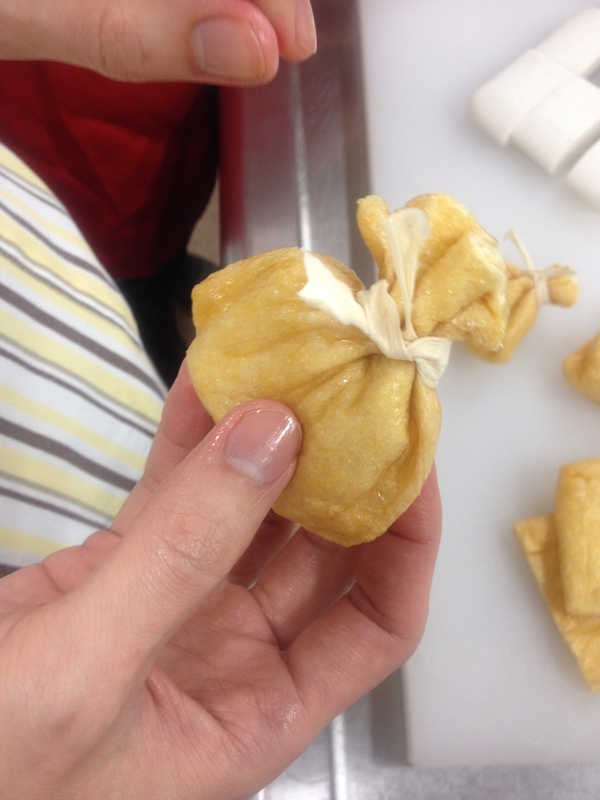 Cut the mochi blocks in half and place them inside the abura-age pockets. Use a length of kanpyō to tie each pocket shut. ① Cut the kon-nyaku into 5 more or less equally sized triangles. ② On one side of each piece, make crosshatched cuts, sprinkle on some salt and rub it in. Rinse the salt off with water. Boil some water and place the kon-nyaku pieces in for 2-3 minutes. This will remove the unpleasant smell kon-nyaku can have. ・ Pour boiling water over the Satsuma-age. ・ Cut the chikuwa into 4 equal pieces with diagonal cuts. Pour boiling water over them. ・ Cut the hanpen into 5 equal pieces. ・ Cut the lotus root into 2cm-wide half-moon pieces and place in water. ・ Cut the konbu you used to make soup stock into 1cm-wide strips and knot. ① Add the boiled eggs, hana daikon, mochi kinchaku, kon-nyaku, lotus root, chikuwa, and satsuma-age to the oden soup stock, cover, and boil for about 20 minutes. ② Once the daikon are up to temperature, add the hanpen and konbu, and boil for another 10 minutes or so. Add the powdered karashi to a bowl, add the hot water, and mix well to achieve a thick paste. Place the bowl upside down on the counter to preserve the pungency of the karashi.